Bee's Circus: 248. 30 week pregnancy update! 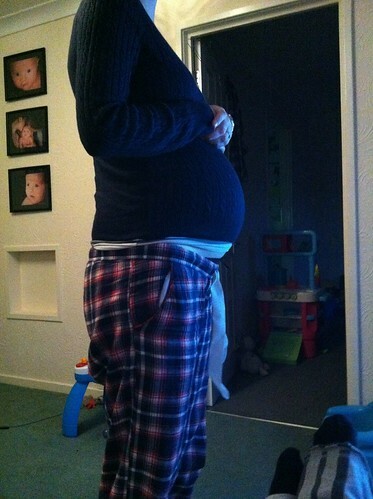 THIRTY weeks (+3), that seems so far! The size of a cucumber, 15.2 to 16.7 inches, 2.5-3.8 pounds, a proper little person in my belly now! I can't decide whether that is a good or a bad thing. 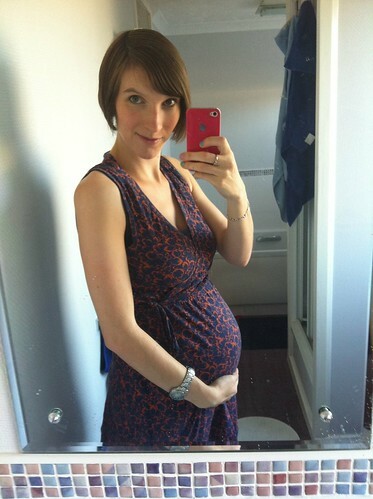 I definitely haven;t enjoyed being pregnant as much this time around, as sad as it is to say, but it is a lot harder. Not even because of Daniel, as he is an absolute angel and always more than happy to entertain himself or snuggle and watch a film (hopefully this continues when the new baby comes!) but my body just isn't coping as well this time around. This belly is BIG, and the baby inside wriggles around like he's having a dance party 24/7! Those darling little kicks I was so excited to feel? Kind of uncomfortable now. I hope this doesn't mean I'm having a giant baby! We have another scan on the 20th, so I guess we might find out then! So on one hand, I'm glad I'm three quarters of the way through, and the end is in sight. I just want him here already! On the other, however, I know our days as a family of three are limited, and our worlds are about to be turned upsidedown by our new arrival. I know it will be hard, and I do want to make the most of this time while it's 'easy', but I think we're ready for the challenge. I really believe that Daniel will be a fantastic brother, he plays so well with baby "Bella" at the childminder, bringing her toys and being gentle. I think Daniel becoming a big brother, so soon, was part of the plan for us. I'm trying to avoid buying any more maternity clothes now, as it seems a waste because I won't be wearing them for much longer, and focusing on nursing-friendly summer clothes instead! I have enough to last me, and while I'm off work for two weeks I'm living in pyjama bottoms and maternity jeans anyway! I gave in, and bought a double pushchair. After walking home from my Nan's the other week and it taking an hour instead of 10 minutes, I decided the pros outweighed the cons, especially if I'm not going to have a car and we need to get anywhere ever. We went to see a tandem double I saw advertised on Facebook, which was in amazing condition and the seller only wants £30, bargain! Now the baby only needs a mattress and the Moses basket from my Mum's, and we'll basically be ready! I'm currently working my way through the latest series of One Born Every Minute, which is so incredibly overwhelming to watch, for my poor ragged emotions! Even before I got pregnant I would cry every time, remembering what it was like to bring new life into the world, but now it has a whole new affect on me! Seeing those tiny babies makes me want mine here, now. Even the idea of labour isn't scaring me this time, I've done it once and I just know the outcome is so worth it! I can't watch One Born Every Minute without sobbing! It's really overwhelming. Especially watching it since giving birth. It seems more real since I went through it myself. Once BabyBoy2 is here, you'll wonder what you ever worried about. He'll fit perfectly into your little family unit. Definitely! I'm trying to be strong this time, and I haven't cried at all today!! The one with the broken-arm-baby though? Ohmygosh, I was a mess!! I hope so, thankyou for your sweet words! !